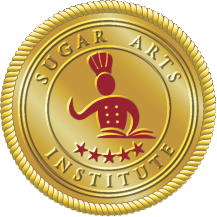 Tips & Techniques - Sugar Arts Institute: Cake Decorating Classes, Receptions, Functions. The gelatin to water ratio is 2 parts water to 1 part gelatin. Put the water in the cup first and then add the gelatin. If you don't you will end up with dry bits of gelatin at the bottom of the cup. Let the gelatin bloom. After it blooms, put it in the microwave for approximately 30 seconds. Depending on the wattage of your microwave. Be sure to watch it, especially if you are using a small cup. If it overflows, clean it with hot water!! You are going to let it sit until the foam is thick enough for you to skim it off of the top. Here is where the toothpick comes in (if you don't want to use a toothpick use a disposable spoon). 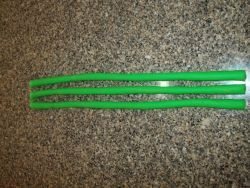 You are going to take your toothpick and pull off the foam from the top and throw it in the trash. Once you do that your gelatin will be clarified. Use airbrush color because of it is liquid characteristics. It blends better into the gelatin. Paste color can be used but it takes a lot more effort to get the color incorporated. Use less color for more transparency and more if you want it more opaque. Stir in your color with a toothpick. After adding the color, put your gelatin back in the microwave for no more than 30 seconds. Pour it out on your acetate sheet (or clear plastic sheet) and use your spatula to spread it out. Don't spend too much time spreading it out because it sets up in less than 2 min. You don't want it too thin (it will be too flimsy to punch out) and you don't want it too thick (it will crack when you punch it out). IT DOESN'T HAVE TO BE PERFECTLY EVEN!!! You will notice that it will become ripply but that is ok.
Set it aside and it usually takes about 5-6 hrs to dry but that depends on your humidity. As it dries it pulls away from the acetate. I let mine sit over night. When it is dry it will pull away from the sheet. Here is the secret to it all...the hole punchers!!!! The hole punchers can be found at Michael's or Hobby Lobby. The ones that I used are the regular hole punch and 1/16 circular punch. Take your small hole puncher and punch a series of holes in a line leaving a space between each small hole so that when you go back to use your "regular" sized puncher you won't overlap wasting your punches. 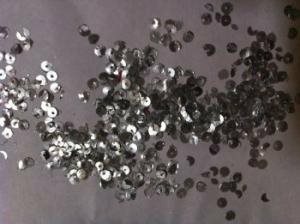 Now comes the best part, open up the holder and release the sequins. For these, I added silver airbrush color and silver luster dust. The effect was perfect. I will never forget the first wedding cake I delivered. It was also, the greatest lesson about cake deliveries. My husband usually delivered the cakes with me, but had to work that day. Raul, one of his friends, volunteered to drive me to the reception hall. When Raul arrived to pick me up, he gasped at surprise for the size of the cake. I tried to place the cake in the car but, as Raul’s car was a Sport Spitfire Triumph 1976, a very small two seats car; it was going to be very difficult to find a place for the cake! Use thick lace with good detail usually called a lace applique. Apply Seal-Dit generously to both sides of the lace. 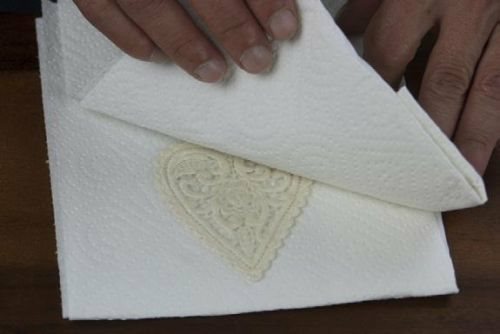 Sandwich Seal-Dit covered lace between two double sheets of paper towels. Place covered lace into warm oven set at 200 degrees F. (93 Celsius) for about 5 to 10 minutes. Remove lace from oven and move and press lace between paper towels until no imprint is left by the melted Seal-Dit. Sheet Safe-D- Clay to the thick- ness you want your lace mold to be. Apply very thin coat of Seal-Dit. Lay sealed lace pat-tern onto sheeted Safe-D-Clay and press downward to get full contact between lace and clay surface. 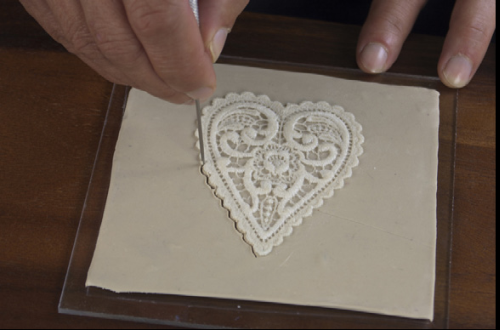 Using a needle tool held straight upward, make passes around the edge of the lace into the clay until the clay has been cut through. Lift and remove excess Safe-D-Clay on outside of lace pattern. Mix parts A and B of Silicone Plas- tique until a uniform blue color has been achieved. Apply a thin coat of Silicone Plastique to lace making sure that every detail has been captured. Ap- ply more Silicone Plastique to create a mold thickness of about ¼ inch. It is absolutely essential that as a business owner, you track your finances and operation costs. Do not avoid the mathematics. Keep them up to date! You cannot determine if your business is successful unless you are fully aware of all the costs and revenues. It is not difficult to calculate your profit margin and your average profit margin percentages, with some basic, straightforward arithmetic. In this tutorial you will learn how to create a simple and elegant monogram cake using Icing Images edible paper to create unique detailed patterns suspended inside a beautiful isomalt cake topper. 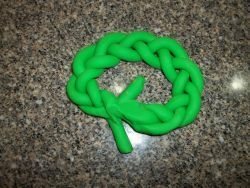 Braiding the coffee ring dough creates a nice presentation and is simple to do. Here, the technique is demonstrated with green fondant to make it easier to see. Braid bottom half of pieces and bring all pieces together at bottom. 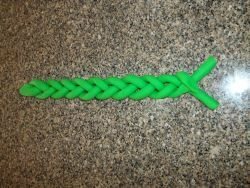 Flip bottom up and away from you so top half is braided. 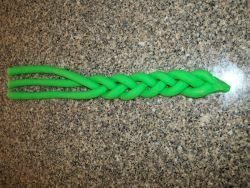 Braid bottom half and leave 2 ends (tabs) out. 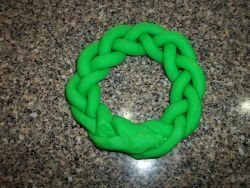 Bring both ends together, placing the closed end in the center of the end with tabs. Flip ring over and when proofed, the seal will not show. THE HISTORY OF WEDDING CAKES The earliest recipe recorded from Britain for a dish for a wedding was in fact a fruit pie. 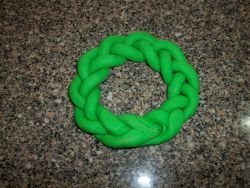 These were piled on top of one another to create a pyramid centerpiece. Queen Victoria was the first queen to use the wedding cake as a focal point at her wedding reception and it was Queen Victoria we can thank for the bridal tradition of wearing white. Before her marriage to Prince Albert on February 11th 1840, the traditional royal wedding dress was silver. Her white wedding dress, trimmed with white honiton lace was a first for the fashion world, so was her matching white, very elaborate wedding cake. Her cake was adorned with cupids, signifying love and dogs, signifying faithful attraction. This masterpiece weighed 300 lbs., was 9' in circumference and was 7' high. At that time, there was no refrigeration, so to preserve cakes in order to accommodate the weeks of elaborate art work in sugar adorning the cake, fruit was saturated in alcohol, whisky, brandy or sherry, (or a little of each) baked. After the cake was baked, the alcohol mix was then brushed repeatedly over the surface of the cake to preserve it and to flavor it. Fruitcakes, like fine wines, mature with age so a long shelf life was recommended. Probably one of the most ostentatious wedding cakes of the Victorian era was that of Queen Victoria's daughter Princess Louise, on her marriage to the Marquis of Lorne in 1871. The Royal Family of the time was opposed to the marriage, but Queen Victoria approved and the couple married in lavish style. 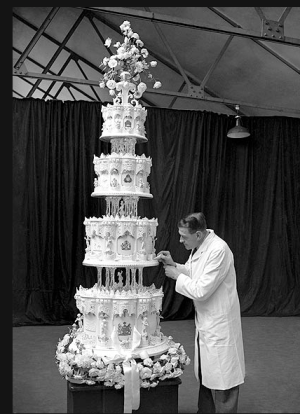 The wedding cake stood 5 feet tall from its base to the top tier and weighed over 225 pounds and, of course, it was finished in fine white royal icing. The first genuinely public Royal marriage ceremony was that of Princess Elizabeth (Queen Elizabeth II) to the Duke of Edinburgh. This was the first televised Royal wedding and the first ever occasion that television cameras had been allowed to film from inside Westminster Abbey. Following the marriage and the day's events guests were invited to an opulent supper. 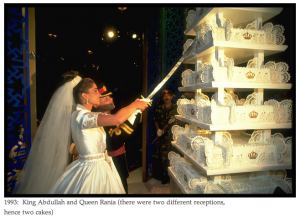 The Royal couple had a total of nine wedding cakes at their reception, with the official cake standing 9 feet tall and weighing in at a staggering 500 pounds. 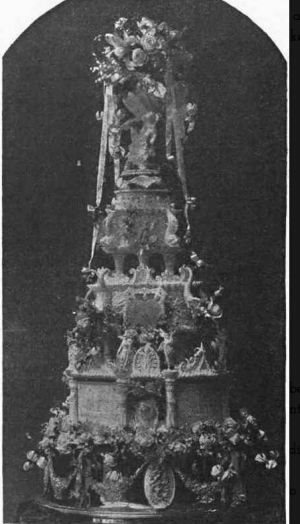 Their official cake had four tiers, three of them replicating in sugar Buckingham Palace, Windsor Castle and Balmoral Castle. Fruitcake is still the traditional cake of preference in England, Canada, Australia and Southern Africa. Traditionally the frosting used to elaborately adorn these fruitcakes was named royal Icing, made from powdered sugar and egg whites. (In 1840 the sugar was laboriously and finely ground using a pestle and mortar.) Royal icing dries extremely hard to support the layers place on top of each other. Columns separating the cakes were disguised pieces of broom handle covered in royal Icing to match the cake icing covering the cake. Because the royal icing was so hard, a decorative silver hammer placed on the cake table and was used to break the royal icing, which was peeled from the cake before the cake could be cut. 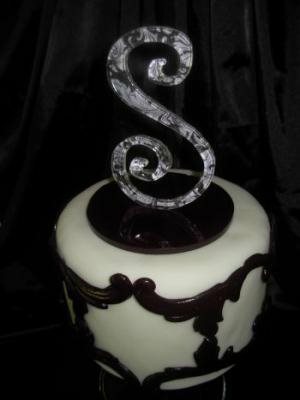 Some 100 years later a new ingredient invention called glycerin was introduced into royal icing. which rendered it softer and prevented the royal icing from becoming hard and brittle. The traditional silver hammer was then replaced with a long serrated cake knife or a royal sword was used to make the traditional and symbolic first cut into the cake. In the 1960’s, an Australian baker created a mixture of powdered sugar, glycerin, liquid glucose, gelatin and a small amount of vegetable fat. This mixture was dough like in appearance and texture and could be rolled out like pastry. This immediately took cake decorating by a storm and became the new fashionable frosting, for covering cakes. Known today as plastic icing (Australian name) sugar paste (English name) and rolled fondant, (American name). The new dough was rolled out and placed over the cake completely enrobing it, and therefore, alleviating the need for covering a cake in royal icing. This new product quickly spread to England and its colonies, and today, is the most popular method of decorating special occasion and celebration cakes. 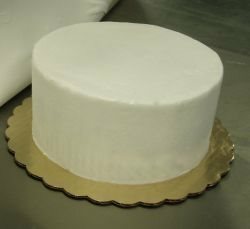 Rolled fondant was introduced to the American market approximately 30 years ago. However, it has only become popular over the last decade with exposure from cake challenges on the television networks. 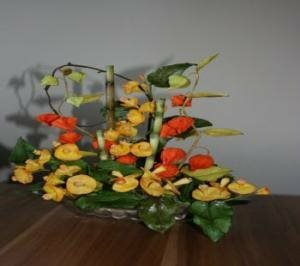 The nature and texture of rolled fondant has opened the doors to much creativity and artistry. 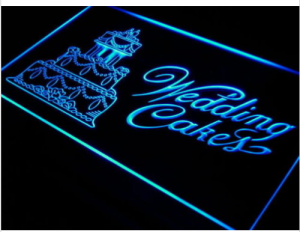 Today wedding cakes are both traditional and contemporary and are often seen not only in the traditional white and ivory, but also contemporary in style. Wedding cake are now displayed in a multitude of colors, shapes and sizes, with an eclectic array of edible bows, flowers, drapes, polka dots and stripes, swirls and curly-cues and designs to fit any theme imaginable.